Home / Custom Issue Fields / How do I allow my Agents to edit Custom Issue Fields? How do I allow my Agents to edit Custom Issue Fields? Allowing your Agents to edit a Custom Issue Field grants them the ability to update the label, field placeholder, and values for a Custom Issue Field. You and your team will be able to tell which Custom Issue Fields can be edited by Agents based on the ‘Editable’ or ‘Not Editable’ statement to the right of the field on the Custom Issue Fields page. 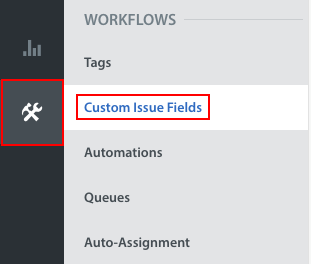 To allow your Agents to edit a specific Custom Issue Field, first navigate to Settings > Workflows > Custom Issue Fields. On this page, click the gear icon next to the Custom Issue you’d like to update the Agent settings for, then select ‘Edit’ in the drop-down that appears. In the ‘edit Field’ pop-up, toggle the ‘Allow Agents to edit this Field’ toggle to either OFF or ON, based on your preferences. Having this toggle ON allows Agents to edit the settings for a Custom Issue Field, including updating the label, field placeholder, values, and archiving the field. Having this toggle OFF will prevent Agents from being able to edit the Custom Issue Field’s settings going forward. They will still be able to update the field as it is listed in the Issue Details page. Click ‘Save’ to update this setting for this Custom Issue Field. To learn how to edit your Custom Issue Fields, see How do I edit an existing Custom Issue Field? If you need to remove a Custom Issue Field, see How do I remove a Custom Issue Field, and what happens if I do? How do I migrate to using Custom Issue Fields when I already have metadata and tags? How do I create a new Custom Issue Field? How do I edit an existing Custom Issue Field?